While masculinities theory has had much to say on relationships of subordination, few feminist legal scholars have examined the implications of masculinities theory for feminist legal theory. 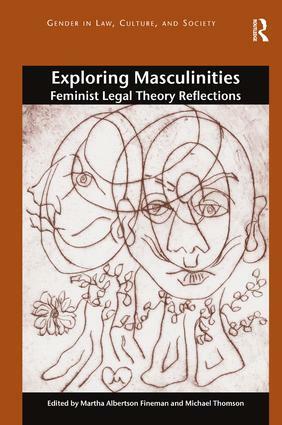 This volume investigates the ways in which emerging masculinities theory in law could inform feminist legal theory in particular and law in general. As many of the chapters in this collection illustrate, law is constantly in a dynamic interaction with masculinities: it has both influenced existing masculinities and has been influenced by those masculinities. The contributions focus feminist and critical theoretical attention on masculinities and consider the implications of masculinities theory for law and legal theory. The book sets out the theoretical trajectory of masculinities studies as a field and its application in law and uses insights from a masculinities approach to study socio-political construction of gender identities in specific settings. It also explores how understanding historical construction of gender identities can inform more effective public policy and activism. Written by leading experts in the area, the book poses important questions about the development of the relationship between feminisms and masculinities theory and will be essential reading for those working in law and gender and related areas. Martha Albertson Fineman is a Robert W. Woodruff Professor of Law at Emory University and an internationally recognized law and society scholar and a leading authority on family law and feminist jurisprudence. Fineman is founder and director of the Feminism and Legal Theory Project, which was inaugurated in 1984 at the University of Wisconsin at Madison, and also directs Emory’s Vulnerability and the Human Condition Initiative. She is the author of numerous books and dozens of book chapters and scholarly papers focusing on gender equality, the legal regulation of intimacy and the law’s response to dependency and vulnerability. Fineman is also editor and contributor to a dozen collections arising from the FLT Project, including At the Boundaries of Law: Feminism and Legal Theory (Routledge 1991, reissued 2013), which was the first anthology of feminist legal theory. Michael Thomson is Professor of Law at the University of Leeds, UK. His research interests include Health Law, Law and Gender, and Legal Humanities. Much of his work has focused on the regulation of reproductive and sexed bodies and what this can tell us of the relationship between law and gender. He is the author of Reproducing Narrative: Gender, Reproduction and Law (Dartmouth, 1998) and Endowed: Regulating the Male Sexed Body (Routledge, 2008), He also edited, with Sally Sheldon, Feminist Perspectives on Healthcare Law (Cavendish, 1998). Gender in Law, Culture, and Society will address key issues and theoretical debates related to gender, culture, and the law. Its titles will advance understanding of the ways in which a society’s cultural and legal approaches to gender intersect, clash, and are reconciled or remain in tension. The series will further examine connections between gender and economic and political systems, as well as various other cultural and societal influences on gender construction and presentation, including social and legal consequences that men and women uniquely or differently encounter. Intended for a scholarly readership as well as for courses, its titles will be a mix of single-authored volumes and collections of original essays that will be both pragmatic and theoretical. It will draw from the perspectives of critical and feminist legal theory, as well as other schools of jurisprudence. Interdisciplinary, and international in scope, the series will offer a range of voices speaking to significant questions arising from the study of law in relation to gender, including the very nature of law itself.